Mixed Race America: At what point does the Asian immigrant become an Asian American? I think that when an adult moves to any other country, they become of that country only when they fully emotionally commit to it. That's a vague standard, but I think it mostly works. Some people who moved against their will, like refugees, are never going to commit. No matter if they spend 50 years in the new country, they're always going to think of themselves as of the old country. On the other end of the scale, very privileged people will often never really commit. They would be giving up too much. They'll live and die as "expatriates". For example, If I moved to Japan and fully emotionally committed to being Japanese, that would mean such things as 1) making a serious effort to learn the language 2) taking part in Japanese society 3) working to fix Japanese problems because they also become my own problems 4) preparing to take the bad along with the good 5) believing I had certain rights and duties as a Japanese. Perhaps this project would fail and I wouldn't be able to actually accomplish all these things. But at least I would have committed to them. Kazuo Ishiguro has a compelling description of how this process worked for him. He moved from Japan to England when he was a small child. His parents always told him they'd be returning to Japan any year, but never did. He felt like he lived in a Japan he kept in his heart, not England. As he left childhood he said goodbye to this personal Japan and committed to being English. The kind of perspective I'm describing is more psychological and emotional than social. But like you say, what the individual thinks, and what society thinks of the individual, are often two very different things. And they definitely influence each other. I found your blog via the Academic Blog Wiki and thought I would introduce myself and my own blog, in which I address miscegenation (both racial and cultural) in the Americas. It's called Domestic Issue. With your permission, I'd like to link to you over there. As for this post's question, I'd second atlasien's comment. Back in the '80s I lived in Mexico for 2years, and by the end of that time I could easily have decided to stay on there. If it hadn't been for the siren song of grad school . . . But as s/he says, one has to want to make that choice internally, no matter the quantity or quality of social ties one has to that place. Quick question - any particular reason you use the term "miscegenation" for your research? I, for one, have all sorts of negative connotations associated with that term - and hearing it in the context of academics gives me automatic assumptions about how you feel about it (especially coming from a "very white" person, as you put it in your blog). From checking out your site, however, I don't think that's your intention (or where you're coming from, necessarily), so I was wondering if there was a reason you didn't go with another term . . . 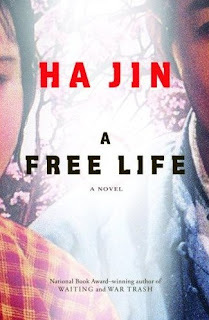 If Ha Jin is writing from his own experience, why would he have to read OTHER Asian-American writers beforehand? Your experience is your experience, and if it happens to overlap with experiences of other people, that doesn't make it less "original" . . .
As for over-indulgence and long-windedness . . . to me, that makes more sense to criticize if that's how you felt about it. Thanks for visiting my blog and for your question. I'll not respond here, but you're right about two things: First, I don't think of it as a pejorative term at all; second, it does indeed have a vexed history for many. I really should address your question more fully, though, and I'll do so over at my blog. AGHHH!!! I wrote this LONG comment and then Blogger told me there was an error and it didn't get saved (sigh). So let me just say a big THANK YOU to everyone for leaving a comment and for this rich discussion. 1) Atlasien, as always I think your comments are thoughtful and right on the money--I esp. like what you say about an "emotional commitment." 2) Cipher/CVT, so much to say about Ha Jin, but I think Cipher is wearing his "lit crit" hat and pointing out something I think is also problematic: a certain desire, on the part of a general American readership, to want Asian immigrant narratives. 3) John B., thanks for visiting and thanks for the shout out on your blog. I took a look at your blog and I also have to say, to reinforce CVT's comments, that I had similar questions about using the term "miscegenation"--so I look forward to reading your blog post and I am now inspired to write a post about loaded terms (because I want to revisit the "concentration camp" issue from 2 days ago). What do you MEAN you didn't like FREE FOOD FOR MILLIONAIRES??? REALLY!! I mean, I did think that Casey got tiresome--I mean, c'mon girl, STOP SHOPPING! Don't buy that expensive first edition book, not only because you're going to end up losing it but because you can't afford it--just stop already! But you know what, I also really liked her. Parts of her. Her life was messy--and it was definitely not a model minority life, so I thought in that way the author was doing something a bit different. Anyway, you can either share what you didn't like about the book here or wait until you see me and we can duke it out over lit (although I'll give you Ha Jin--I wasn't crazy about him to begin with--I just found A FREE LIFE so much more appealing than the dreadful WAITING and the even more depressing OCEANS OF WORDS and I seem to be one of the few people not to get him--because really, I don't get what others get in his writing. On the commitment thing, I think it can cut various ways. I can't remember now whether it was Stuart Hall's or Paul Gilroy's story first about the Tory politician who defined British immigrants' lack of commitment by criticizing their fan loyalties when it came to cricket (missing the obvious point that liking cricket at all perfectly establishes your Britishness so as to define Englishness as something quite different). So something I endorse on the personal level (I've thought the same thing about moving to Japan) can get twisted around on the political level. Or become a self-advertisement like it sometimes seems it does for Bharati Mukherjee. I wonder if David Palumbo-Liu's Asian/American might offer some useful insights on the broader questions that Jennifer is raising, not that I've gotten around to reading it yet! I've only read his Waiting and enjoyed it. I'll check this one out, too. Thanks for leaving a comment. The truth is, unless you really like Ha Jin, I think there are better 600+ page Asian American novels to check out. For example FREE FOOD FOR MILLIONAIRES by Min Jin Lee. Or RED EARTH POURING RAIN by Vikram Chandra or even the monster of all novels A SUITABLE BOY by Vikram Seth (clocks in at 1400+ pages). For less time on your hands I'd suggest A LONG STAY IN A DISTANT LAND by Chieh Chieng or BEHOLD THE MANY by Lois Ann Yamanka.